The Austrian real estate market is of relevant size and offers many interesting investment opportunities for local and international players. In order to identify strong co-investors it is essential to fall back on a comprehensive database. However, there is no suitable overview yet. 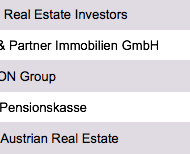 ResearchGermany tries to fill this gap by providing the Top 50 Real Investors Austria list. This list includes institutional investors, real estate PE-funds, expanding hotel chains, funds and several more suitable investors. You can directly contact the investors via email, phone and/or LinkedIn. In many cases we also offer a personal, responsible contact partner. Through just a few clicks you can sort our list (e.g. : “Show me all commercial properties investors with headquarter in Austria”). You will save tons of time of exhausting research. 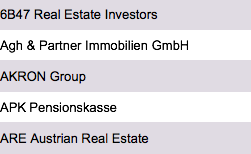 Our list offers detailed information about the most important Austrian Real Estate Investors.